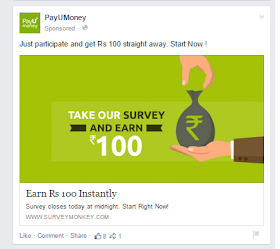 Complete a survey about PayUMoney at survey monkey and get free Rs 100 in your PayUMoney account. This offer is for PayUMoney new users but you can always make a new account with new e-mail ids. So, we also have a PayUMoney unlimted trick for 100 Rs in every new account you make and the trick can be done in your android phone as well as PC. The surveys at SurveyMonkey are trusted and people do get rewards for completing surveys. So have faith on SurveyMoney and complete the PayUMoney survey. 1. Go to the PayUMoney Survey link -Here. 2. Choose the options which is best suited for you and complete the survey. (It wont take more than 30 seconds). 3. After completing the survey you will be asked to provide your e-mail and mobile number. Put your email and phone number if you are not registered at PayUMoney, if you are registered at payumoney then use a new unregistered e-mail and phone number. 4. You will get this page now. 5. Click on done and wait till 10th June, 2015 for mail from them. In SurveyMoney you can't complete same survey twice, so just change your IP with droidvpn or hotspot sheild vpn (In PC open Chrome's incognito window) and open the survey link again. You will see that the survey is opening again, now complete the survey and provide new e-mail and phone number at the end. Keep on changing IPs and complete same survey and earn unlimited 100 Rs in different PayUMoney accounts.